When starting a handyman business, the biggest challenge often is finding the client who will hire you. You may be lucky and find clients in the least expected places: for example, a member of your church may ask for your help in installing her screen door, and word could spread around the congregation of the wonderful job that you do. However, you may have to really think hard where to find your customers. Who is the market that you want to serve? How do these markets typically go about searching for a handyman? How easy is it for you to tap that market? How many competitors, if any, are already serving that market? The first step in marketing is identifying your target market. You need to determine who your customers will be and start thinking of ways and strategies to reach the target clients. One possible market that your handyman services can tap is the home sale market. This is a ripe market for a handyman service as you can offer your services to the both ends of the spectrum: the home seller and home buyer. As the housing market remains sluggish in many markets, homeowners are pressured to ensure that their homes present well to the buyers. For their homes to sell at a good price, the home owner needs to make some repairs and improvements — from doing some minor carpentry work, repainting walls, to doing minor repairs and cosmetic changes in the bathrooms. Unless the house is sold as-is, home sellers looking to get the best possible offers understand the importance of turning their outdated homes into freshly updated houses that buyers would love. Home buyers, on the other hand, often need help sprucing their new homes and modifying it to suit their own tastes and preferences. They may want to repaint the walls, build a few shelves, clean gutters or do minor repair in the deck. 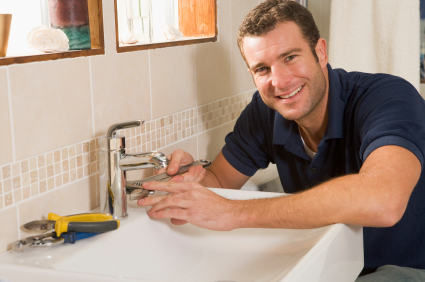 Another market segment that a handyman business can tap is the do-it-yourself market. While some home owners are well capable of doing their DIY projects, many DIY projects turn into a disaster. After starting the project, the homeowners then find themselves way over their heads with the project and realize that they do not have the skills or tools to complete the project. Worse, they realize this when they have made a mess of everything! Your handyman service can fix the mess that the homeowners have created ands complete the customer’s DIY project. Or, it could be possible that the DIY homeowners may use your handyman services to provide additional help for their projects. While they do most of the work, the homeowners may realize that there are jobs that are beyond their expertise and capabilities, and that a skilled tradesman is better suited to complete the task. The rental market is another segment that requires handyman services. Apartment and condo owners, as well as beach and vacation home owners, need to keep their rental properties in tip-top shape. While some rental property owners will do the work themselves, most will need the help of handyman for the constant repairs and maintenance that rental properties require. The apartment and condo market owned by property management companies are also big markets for handyman services. An important element in the success of your handyman business is how well you are able to market the business. Marketing should be part of your daily activity, and your goals should always be to look for ways to effectively reach your potential customers. Wrap your car or use a sign to post your company name, phone number or website address. If you have a truck for your business, be sure that your business name is visible to traffic. Create a website and optimize it for local search marketing. Include photos of your past projects. If you hsve the time, create tutorial videos on how to do some repairs. Add a blog component to your website where you can provide home improvement tips and talk about the things that you do. Don’t be afraid to ask your existing clients for referrals. Be open to offering discounts to clients who refer you to others. Develop partner relationships with big contractors. They often have big jobs where they may decide to subcontract a portion and hire an experienced handyman to assist them. Experiment with Groupon or LivingSocial – you can offer one, two or even four hour handyman services at discounted prices. Clearly indicate what services could be accomplished with a one hour deal as compared to a fours hour deal. To reach the sellers and buyers markets, network and get to know real estate agents in your area. They can recommend you to the home owners to fix, update or change the look of the homes that they are selling or buying. You’d want to be their go-to handyman service for repairs and upgrades. Wear t-shirts with your business name and logo, whether you are on the job or in your favorite home improvement store. Not only do you look more professional, but you become the walking advertisement for your company. The Web has become a powerful medium for finding information, including services needed. You must have a strong web presence, even if you are just targeting the local market. Also learn how to use Google Places for your business. Study Google Plus Local https://plus.google.com/local on how to get your business to show up for Google Plus users in your area. It is also important to recognize that a growing number of people consult online business reviews before making a purchasing decision. They want to see the feedback from other users of the business to help them make a choice whether they should use or avoid the service. Foremost among thee review sites are Angie’s List and Yelp. Don’t ignore these sites, but don’t try to pad positive reviews as well (these sites have proven mechanisms to determine fake reviews). Take note of the criticisms against your business. If the review site allows for a response from the business owner, respond politely and matter-of-fact. Also ask your satisfied customers if they could write a review of your services.